Established in 2011, Precision Teaching Learning Center (Precision TLC) is a learning center supplemental to public, private, or home school. Through focusing on core subject areas (reading, reading comprehension, math, writing) we transform how individuals learn. Said another way, we target the underlying processes that control learning through the methods and measurement of Precision Teaching. These methods then produce fluent responding that is accurate and effortless. Our expertise is not with homework help or content course tutoring. However, learning deficits can often manifest as difficulties with independent working, motivation, or comprehension of a particular subject. These situations are very appropriate for our services for which we can remedy. If your child were to enroll with us, he/she would work with a highly specialized team of behavior specialists. All cases are ultimately supervised by Dr. Milyko (remote supervision) and Samantha Spillman (on-site supervision). Each case is spearheaded by one of our Case Managers who is aptly suited for your individual child's needs. Your child will work at least 1 session a week with his/her case manager and another instructor. Quality of service and adherence to protocol are continually evaluated by our staff trainer, Ethan Milyko, and followed up with Sam's supervision. This ensures that while your child will benefit from the variance in personality and rapport, he/she will receive the same level of quality in treatment with every visit. Dr. Milyko is one of the newest leaders within her specialty: Precision Teaching (PT). Within just a few years, she helped develop a learning center, executed various research projects, was appointed as Contributing Editor of the scientific journal of Precision Teaching, and was elected to serve as Vice President then President of the governing agency of Precision Teaching. All of this was accomplished while she was working on a doctoral degree at the University of Nevada, Reno (2011). She now supervises both Tampa centers, teaches other professionals to incorporate PT into their treatment, and teaches graduate students as an adjunct professor. Kerri Milyko is a Board Certified Behavior Analyst, Doctorate Level. She began her training to apply learning science, Behavior Analysis, to education under the supervision of Dr. Hank Pennypacker at the University of Florida in 2002. Upon graduation, she moved to Reno to further this training under the supervision of Dr. Patrick Ghezzi and Dr. Kimberly Berens. In 2003, she joined the Center for Advanced Learning, Inc. team to transform learning for a multitude of children ranging from those with special needs to those who are gifted and talented. Dr. Milyko played a significant role in developing the center, expanding the number of clients from 5 clients to over 50 clients in one semester. Furthermore, she aided in the generation of various curriculum lines and led the expansion of the math curriculum. She has worked with and supervised cases of typically developing students, gifted and talented students, students with learning disabilities (Attention Deficit Hyperactivity Disorder, Central Auditory Processing Disorder, Visual Processing Disorder, Dyslexia, and Dysgraphia), students with developmental disabilities (Autism Spectrum Disorder, Down Syndrome, Trisomy 7, Cerebral Palsy, and Mental Retardation), as well as adults in need of assistance with writing and math. Her training and experience in Reno from 2003 to 2011 granted her the know-how and freedom to bring this technology and science to the Tampa Bay area. Dr. Milyko constantly aids in the expansion of various professional and scientific practices of learning science, including Precision Teaching and Direct Instruction, through different avenues. She served as a Contributing Editor of the scientific journal, Journal of Precision Teaching and Celeration (2008-2013) where she reviewed and edited research manuscripts on the basis of procedures, content, and data analysis. Additionally, Dr. Milyko was elected as the Vice President of the Standard Celeration Society (SCS) in 2009 and rose to the presidency (2010 - 2014). She now functions as the Past President and VP of Finance. The SCS governs the scientific community that consists of behavior analysts, precision teachers, direct instructors, SLPs, OTs, gen-ed and special-ed teachers, and parents. To help spread her love and passion for the field, Dr. Milyko now serves as adjunct faculty teaching graduate-level behavior analysis courses at the University of West Florida and Kaplan University. She has published twice in scientific journals, presents at least yearly at national conferences, and visits schools and universities around the country to train and educate students and professionals. See her vita details regarding publications, presentations. and posters. Dr. Milyko is a proud Florida Gator, graduate of the University of Florida with a Bachelor of Science degree in psychology and a minor in business. Her undergraduate mentor, Dr. Henry Pennypacker, encouraged her to seek a graduate degree in behavior analysis which led her across the Mississippi River for the first time. Dr. Milyko completed a Master of Arts degree in psychology at the University of Nevada, Reno (UNR) in 2008 and completed a doctoral degree in psychology specializing in learning science in the fall of 2011. Her master's thesis researched reading processing speed identified as Rapid Automatic Naming (Milyko, Berens, & Ghezzi, 2012). Her dissertation evaluated percentile schedules of reinforcement as a systematic shaping procedure to more effectively and efficiently shape acquisition behaviors under the advisement of Dr. Patrick Ghezzi. Samantha (Sam) joined the Precision TLC family in January of 2013 while completing a Master's Degree in Applied Behavior Analysis (ABA) at the University of South Florida. Simultaneously, Sam gained experience working in the Hillsborough County Public School district as a behavior assistant through a grant funded by the USF ABA program to train school-based behavior analysts. It is at Precision TLC, however, that she was able to combine her love for children, education, and behavior analysis and grant her the freedom to make a lasting impact on students' lives. Her thesis originated from a case-study at the center where she taught a skill by combining multiple learning channels, or modalities of engaging in a behavior, to promote rapid acquisition, application, and retention. She then applied the same technique to at-risk students in a struggling public school in the Tampa Bay area. She also co-authored a case-study with Dr. Milyko that was published in 2015 from the scientist-practitioner model that is utilized at Precision TLC. Upon earning a BCBA, she was promoted to regional director of the Tampa Precision TLC sites. Currently, Sam also volunteers for the Standard Celeration Society serving as the Co-Chair to the VP of Programs. In this role, Sam is one of the key players at organizing and running the annual International Precision Teaching Conference. Ethan has been utilizing Precision Teaching since 2005. 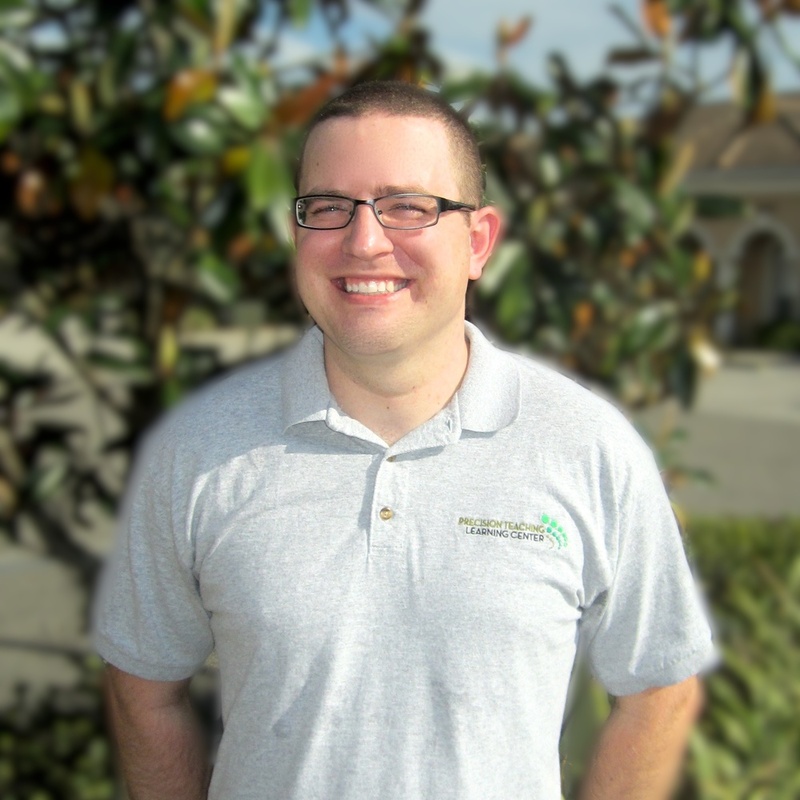 Like Dr. Milyko, Ethan began his PT career at the Center for Advanced Learning, Inc. in Nevada while completing a Bachelor of Science in Psychology at the University of Nevada, Reno. Together, he and Dr. Milyko united to form Precision Teaching Learning Center to meet the needs of students in the Tampa Bay area. He has worked with a wide variety of clients including those diagnosed with ADD, ADHD, ASD, dyslexia, dysgraphia, memory disorder, specific learning disorder, typical students, and those identified as gifted and talented. He often works with our older students in higher content areas including Algebra, Writing, and Comprehension/Reasoning. One of Ethan's strengths is building up a solid rapport with students and creating a fun-filled environment to promote learning in his sessions. While he may be firm at the onset, once rapport is established his sessions can often be mistaken for an hour of playtime until you see the data in the student's program book! It is amazing what a strong rapport in combination with effective instruction can do to academic performance. With a keen eye on detail, Ethan has been leading the training of our instructors. His standards are high and given his lengthy experience with many types of students, he will create scenarios for our instructors that will keep them on their toes! It is not until after a period of at least 3 months of training that they are ready to work with clients, not because of the instructor's weakness but because of our very lofty and rigorous expectations. Therefore, Ethan likes to create this artificial history for the instructors so when they are working with a student, very few situations or behaviors are unique occurrences. Neelam started as an instructor at Precision TLC in early 2014 and quickly elevated to the Case Manager position. She strives to make every session with her students engaging and fun by including some silliness and conversation interspersed with the academic rigor of the Precision Teaching model. Her goal is to foster a love of learning and confidence in her students by the time they are finished at the center. She joined Precision TLC as a graduate student in the University of South Florida's Applied Behavior Analysis program. It is at USF where she received both a Bachelor's of Arts degree in psychology and more recently a Master's of Arts degree in Applied Behavior Analysis. While in the ABA program, Neelam was involved in multiple projects including undergraduate teaching of ABA courses, staff and parent training to successfully implement behavior plans, and curriculum development for children with educational and behavioral deficits. Further, she was one of the primary graduate assistants on a federally funded research study, "Development of an Intervention Model to Improve Educational Outcomes of Youth in Foster Care by Decreasing Runaway Behavior." Finally, her master's thesis investigated the use of response boards in a classroom setting to help decrease distracted and problem behavior. From this extensive experience and training, Neelam recently became a Board Certified Assistant Behavior Analysis. Neelam's recent project is developing a curriculum line for Precision TLC to target Self-Determination behaviors. This is the ability to define and achieve goals based on a foundation of knowing and valuing oneself. Key areas include Choice/Decision Making, Problem Solving, Goal-Setting and Attainment, Self-Awareness, and Self-Advocacy.